Chinggis Khan's fabled city site Khara Khorum, founded in 1220 at the crossroads of the Silk Road , is main cultural tour destination and gives you real insight into Mongolian history & culture. Khara Khorum town existed for 140 years, but it was the capital of Mongolian Empire for only 32 of those. Khara Khorum was the true urban, diplomatic and commercial center before, when Khuvilai king /the grandson of Chinggis King/ made to move Khara Khorum to Beijing in 1260. Later in 1364 after the Yan Dynasty collaps Khara Khorum turned into the capital city again. In 1235 a lot of buildings, commercial streets, Buddhist temples, Christian and Muslim churches, building material houses and other big objects were built in this town. The most famous gorgeous object was Golden Gorde Palace of Ogoodei Khan, who is son of Chinggis Khan.The palace housed for Silver Tree fountain with angel figure, which had 4 branches delivering wine, mare's fermented milk, terrachina beer and one kind of juice. Therefore, the city was metropolitan capital with western and eastern styled buildings and houses. 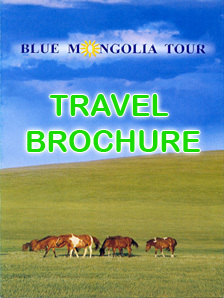 Erdene Zuu Monastery is located north west of imperial site at Khara Khorum. In 1586 Mongolian King Avtai Sain Khan built the first Buddhist monastery-Erdene Zuu monastery on ruins of Khara Khorum. Monumental walls with 108 stupas and 4 gates, which had the defensive role, surround Erdene zuu monastery. Erdene Zuu Monastery is not only historical significant site, but also cultural and intellectual artwork. It is testified with 3 temples buildings, which was constructed in the way of padlocking woods, it means, without using any nails. There are displayed many valuable collections of sculptures, artworks, gold statues, religious masks, appliqués, mineral & oil paintings and portraits of gods, which were created by Mongolian masters in XVI-XVII centuries. All these collections demonstrate an artistic heritage of steppe nomads and their wonderful skills in XVII century, when the upgraded technique and machines were not introduced. 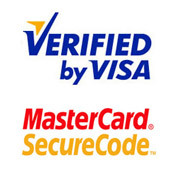 The most popular displays are gold Tara figures, rock inscription in Mongolian and frescoes. The Palace of Ogoodei Khan was built in the south west of Khara Khorum town. The palace was the most beautiful gorgeous palace in Khara Khorum. Excavations, carried out in 1949 by Mongolian-Russian expeditions, covered ceramic and metallic objects, also at revealed Buddhist frescoes. This palace was of some importance, although the emperor lived there only twice a year. 2 years ago Mongolian and German Science Academy expedition group handled the excavation in the ruins, and they discovered and found the heating system pipes, which proves the nomads used to use the modern heating system in XIV century. 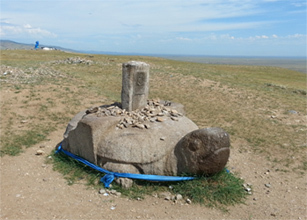 There are 2 turtle rocks in Khara Khorum, one is on the north part of Erdene zuu, and another one is located on the south hill of Erdene Zuu monastery. The turtle rock on the hill is the ancient original turtle, which was set in XIII centuries. The turtle is symbol of immortality and it protects something from flood danger. Therefore, Mongolians set 4 turtles on the four sides of Khara Khorum capital. The Khoshoo Tsaidam offertory sites with rock inscriptions are the most ancient Turkish historical sight and Blue Turkish linguistic heritage. Offertory site for Turkish King in Khoshoo Tsaidam has 2 important monoliths located near on another. 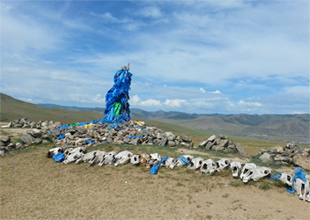 The first monument is dedicated to Turkish prince Kultegen, who was living in 685-731 in recent Mongolian territory; another is devoted for his brother Bilge Khan. The brief information about Turkish culture, history, tradition, religion, military activity, society and Turkish tribe's life are written on these memorial monuments. The meaning of the stanzas on the monument is to praise the majesty of Kultegen King. This memorial monument is not only the rock inscription, but also it shows the carving ability and culture, for example, the interlaced dragons, seal and so on. Khara Bukha Fortress ruins are dated to 2different times: 1. 10-11 century it was the city of Kidan empire for 100 years and it was ancient Silk Road center town. 2. In the first half of 17 century the Buddhist temples were built in this fortress. There are traces of town quarters, remains of temples, stupas, rampart about 12 meter tall, formed of a thick wall of unbaked bricks. Several stone steles with inscriptions in Turkish and Uigur can be still seen in the town ruins. In 1970 archaeological expedition found the old vase, porcelain and pottery pots and old books written in Mongolian old script.